Hide and Go BOOM! is a 1-vs-3 minigame from Mario Party 4 and Mario Party: The Top 100. Its name is a pun on the actual game Hide and Go Seek. The solo player is seen on some tribal ground with four cannons behind. 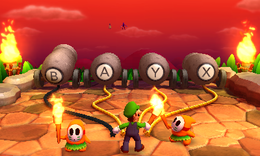 Three players jump from each cannon. The camera zooms out and the game begins. The solo player has a torch, while the team has five seconds to hide in any of four cannons, labeled / , / , / , and / . Initially, the team players can be seen moving toward a cannon, but as the camera pans to the solo player, the team players are eventually hidden. Team players hide in a cannon depending on the last button pressed; if no buttons are pressed, the players are eliminated via a trapdoor opening beneath them. It is possible for more than one player to hide in a single cannon. 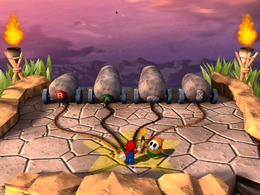 The solo player then has three chances to eliminate the team by lighting the corresponding fuses leading to the cannon. If one or more characters are hiding in the cannon, they get shot off and eliminated. The solo player wins if they eliminate the team, but the team wins if any are left remaining. If the solo player wins, they will do their victory pose while the remaining Spear Guys celebrate with the solo player. Losing players are not seen. If the three players win, they will come out of their cannons (if there are any left) and do their victory poses while the solo player sulks in disappointment. Game Rules – "The team players can hide in any of four cannons. The lone player must fire the cannons to find them." Advice – "The last button pressed by each player decides which cannon each player will hide in. Wait until you are offscreen to hide!" Description – "Can you hide in the cannons well enough so that the fuse-lighter can't find you?" On-screen (Lighter) – "Guess which cannons have rivals hidden inside!" On-screen (Lighter) 2 – "Choose a fuse to light!" On-screen (Hiders) – "Select a cannon to hide in!" On-screen (Hiders) 2 – "Choose a cannon to hide in!" Spanish El escond... ¡pum! Hide... boom! Italian Nascondino esplosivo! Explosive hide and seek! This page was last edited on August 4, 2018, at 09:23.